1876. Cornelius Vanderbilt lies close to death in his New York townhouse. Outside, a carnival-like atmosphere of reporters, those who made him a household name, gather to wait for the end. Cantankerous old Vanderbilt is not done yet. He’s not ready to die. He allows a journalist, Michael Burch, inside. He’s worried about his legacy. He intends to make sure his story is told properly, the way it should be told. How a dirt-poor farm kid from Staten Island grows up to be first among America’s tycoons: admired by the public, consulted by Presidents, and feared by anyone who screwed him. Burch and Vanderbilt go at it. Vanderbilt has more than an earful to dish out, unending amounts of piss and vinegar ready to be spewed. Also spit. He is anything but easy, but the story is there. Age 11. Vanderbilt quit school in the 5th grade , partly in defiance of his beloved teacher, who regarded him as an opportunity to let out his animosity on a deserved victim. He was like his older brother. He didn’t do his homework and quit school young. Both were groomed by Cornelius Sr., an illiterate man who was full of get rich schemes. He always went for the easy way. Little wonder that the Vanderbilts were assigned little status in the community. Poverty generation after generation. And their own fault. Even after he rose to great heights, Cornelius couldn’t spell the simplest words. Burch is genuinely curious, amazed really. How did this kid end up the richest man in the world? The story is huge, not quite Christ like, where in the retelling a common man becomes God, more like regular guy becomes king. Even then the regular guy is not from a Dickens story, where virtue and hard work are duly rewarded. Vanderbilt is a ferocious competitor, a cursing, Pete Rose of a man. Pete Rose got more hits than anyone who has ever played baseball. Legitimately. Yet he is banned from Baseball’s Hall of Fame by a committee that won’t forgive him for gambling on his team. Didn’t matter that he never bet against his team. He broke one of their sacred rules. Pete Rose and Vanderbilt were kindred spirits. Both did whatever had to be done. Both refused to lose. They didn’t understand the word `no’. Vanderbilt found a way. It wasn’t always zippity clean, but it aways was legal. The Commodore was born in 1793, when New York and America were still young, at a noisy time of dire and ordinary poverty when, despite the lofty rhetoric we now memorialize, in bad times people starved to death, and most, barely got by. No one could possibly imagine the meteoric trajectory that would materialize, not only for Cornelius Vanderbilt , but for America. He started with a small sailboat at 16, taking passengers across the bay from Staten Island to Manhattan. At night he delivered freight. It didn’t occur to that boy that one day he might rule the financial universe. His business plan during the fist year was inspired. It was resolute. He was determined to pay back his mother’s loan for his boat after one year. He paid her 10 times over, just like he bragged he would. He was very good at what he did, or if not, he made himself very good. At 16 his focus was on being able to provide what his mother needed. When effort and determination were necessary it could be assumed. If guile and ingenuity were required? Also no problem. That came to him naturally. As a shrewd business man he preferred being thought of as stupid. (Not in his personal life, but that’s a different story.) His crudeness was an advantageous façade. The stupider others thought he was, the easier to outsmart them. In the classroom he may have been a dolt, but elsewhere… He designed the engine for the fastest ship in the world. During the insane Gold Rush years, it was Vanderbilt who dreamt up and delivered the fastest route to California. Everyone else had frenzied travelers, rushing to get rich, climb the mountains of Panama, passing bandits and barrooms. Vanderbilt went through Nicaragua. His early wealth came from that little project. And so it went. He worked without vacation for 60 years, got into fist fights well into his 50’s. In his 70’s, when others his age were settling into a comfortable rocking chair, he changed from ships to railroads without a bump. It never occurred to him to quit. He followed the same business principle that energized him from the beginning. He loved making money. He went where it led him. Vanderbilt’s story should appropriately end inside Grand Central Station. Not even commuters hurrying along, can pass through Grand Central’s main concourse without experiencing the presence of a powerful architectural will. The eyes are swept upward. Our vision soars, uncontained. The station’s vastness captures even the reluctant soul. In that sense the station most resembles a cathedral. It was finished three years after the Brooklyn Bridge, four years after the Suez Canal, during an era, when everywhere, men were building huge monuments to modern capability, the trans continental railroad, the Eiffel Tower, the Metropolitan Museum of Art, the Statue of Liberty. It was a time celebrating the greatness of man, a time when can-do people believed their triumphs were just beginning. The God fearing were offended. To them the spirit of the age was hubris. We were creating Towers of Babel. Perhaps now, Grand Central Station might be spared that charge. Or maybe not. It wasn’t a museum for the worship of awesome man made treasures, but it was a wonder, the towering portal to what was, in its day, the Empire State. Grand Central Station was far more Vanderbilt than his other wild fantasy. He wanted to build a giant statue in Central Park, where he, the largest employer of men in the nation, with more money than the U.S. Treasury, where he and a giant likeness of George Washington would tower over Central Park. Make no mistake, he was truly the king of his era. Lesser men, generals and statesmen often were memorialized with statues in the park. But still, although George Washington may have been his idol from childhood on, and many at the time, might have agreed with Commodore assessment of his importance, future generation would have found his pomposity laughable. Fortunately he was talked out of that project. Grand Central Station is exactly right. It is a place where millions upon millions of travelers rush through, hour after hour, day after day, year after year. It is a passageway, not an end point. Vanderbilt was the Steve Jobs, the Jeff Bezos, the Warren Buffet of his day, forever creating and reinventing projects, invariably contesting the way others did things. The public was ga-ga about him, so much so that, in an envious fit, Mark Twain lost control. He took a shot at him, ridiculing the public’s ape like fascination. Twain couldn’t have been further off. He presented Vanderbilt as a forever hungry man, for whom nothing would ever be enough. He didn’t understand that’s what the public liked about him. He arose from them, and remained one of them. Hungry. They liked the spectacular projects going up everywhere. It excited them. It was a different age. Not microchips, huge undertakings captured the public’s wonder. Even now, the Statue of Liberty, the Eiffel Tower, Grand Central Station, the Brooklyn Bridge bring millions from far and wide to gaze at what men can do. 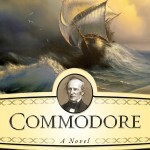 Despite his spitting and cussing, his crabbiness and bitterness, Commodore infuses the reader with his powerful spirit. But they will also be present when Vanderbilt experiences his biggest failure, when he does what every man must do, lose. He dies.